The Holiday season and these "brilliant flakes of gold" were meant to go together! 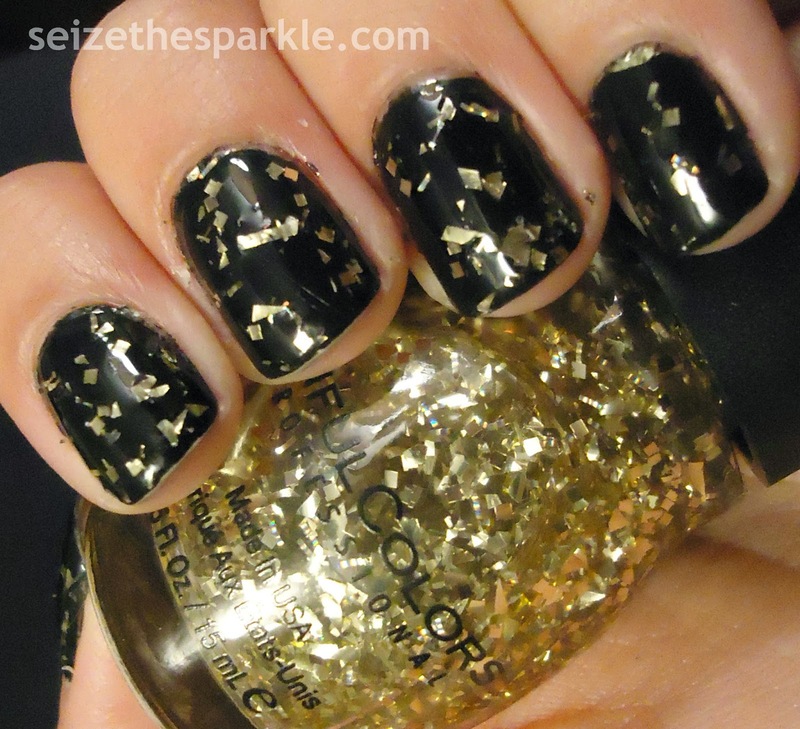 This gold flake glitter topper is a great way to add a whole lot of luxe to your manicure! 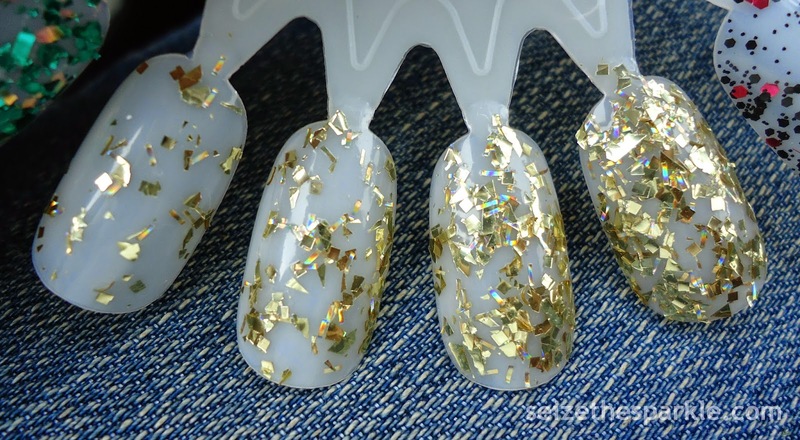 Twilight Twinkles contains a mix of small gold hex, gold square, and gold flake glitter in a clear base. 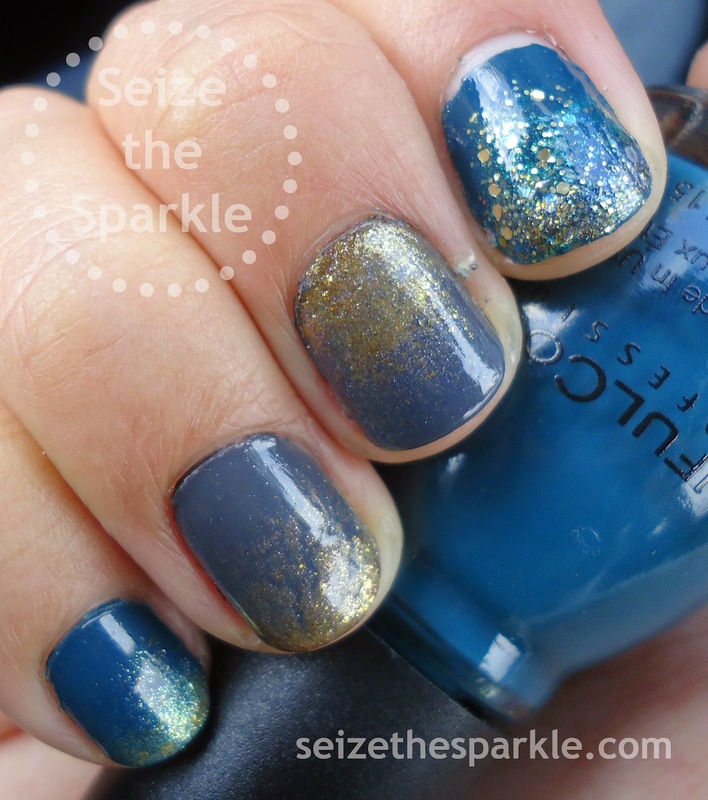 Just one coat adds a bunch of sparkle! 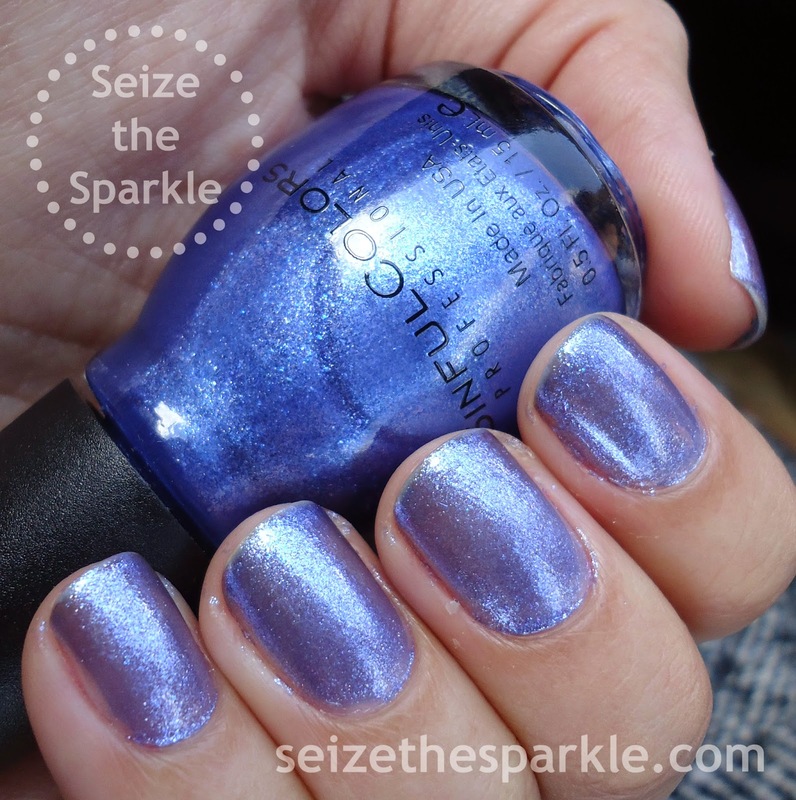 Twilight Twinkles is part of SinfulColors Holiday 2014 Collection. You can find it in the SinfulColors Holi-Dazzled display, available exclusively at Walgreens for $1.99 a bottle! The full collection also contains Decadent, Galax-Sea, Hottie, Let's Talk, Out of This World, Pine Away, and Sugar Sugar. Follow SinfulColors on Facebook and Twitter. 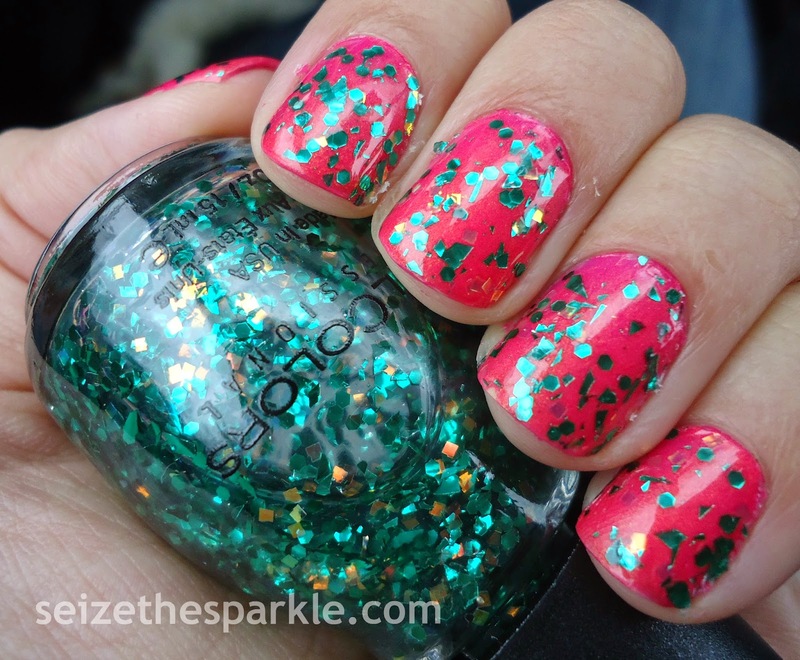 When I first saw these "magical green flakes," I knew they had to be layered over pink. 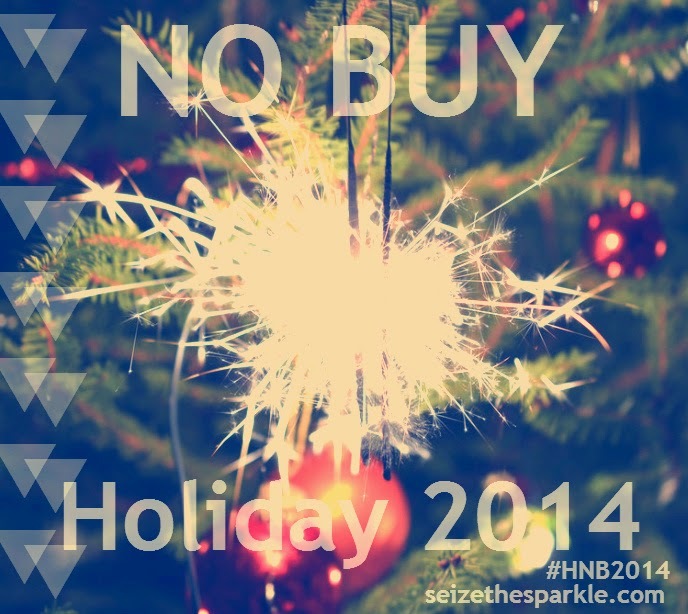 Think of it as a modern take on this festive time of year. It's a great way to incorporate a little Holiday spirit into your nails without going too over the top. We've got plenty of time for that come December! 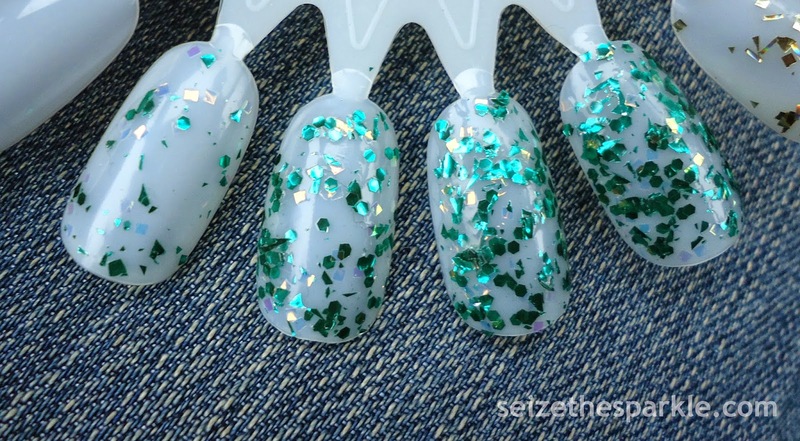 Galax-Sea contains green hex glitter, green glitter flakes, and irridescent square glitter. I'm not usually drawn to green glitter, or really green polishes in general, but this one is definitely unique. A mix of shard and square glitter? Sold! The base of Galax-Sea is clear, with just a smidge less glitter payoff in one coat than Unwrap Me. That being said, it builds nicely, and 2 coats was definitely enough to layer over Cream Pink for my pictures. And about those green flakes, or shards, as some like to call them... I didn't find them to have overly sharp or jagged edges. I mean, I can feel slight indentations, and you can see some in my pics, but that's pretty normal. As a precaution, I used 2 coats of clear, (rather than one) then topped with Good to Go. I had a feeling I would really like this layering, and I'm definitely sad that it's going to come off this evening. BUT... I'm also really excited about the next mani I've got planned, and the one after that! Galax-Sea is part of SinfulColors Holiday 2014 Collection. 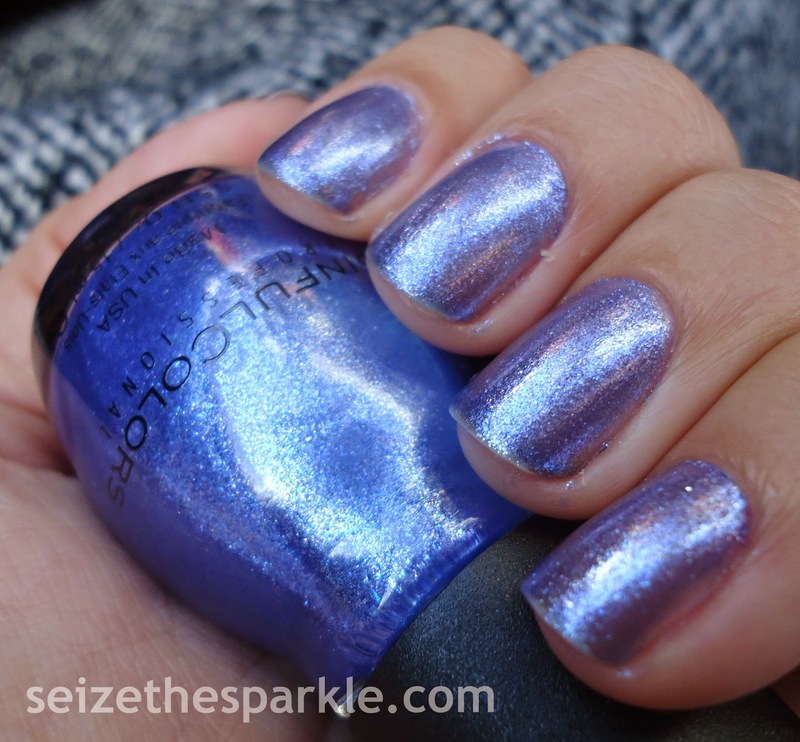 You can find it in the SinfulColors Holi-Dazzled display, available exclusively at Walgreens for $1.99 a bottle! The full collection also contains Decadent, Hottie, Let's Talk, Out of This World, Pine Away, Sugar Sugar, and Twilight Twinkles. Follow SinfulColors on Facebook and Twitter. 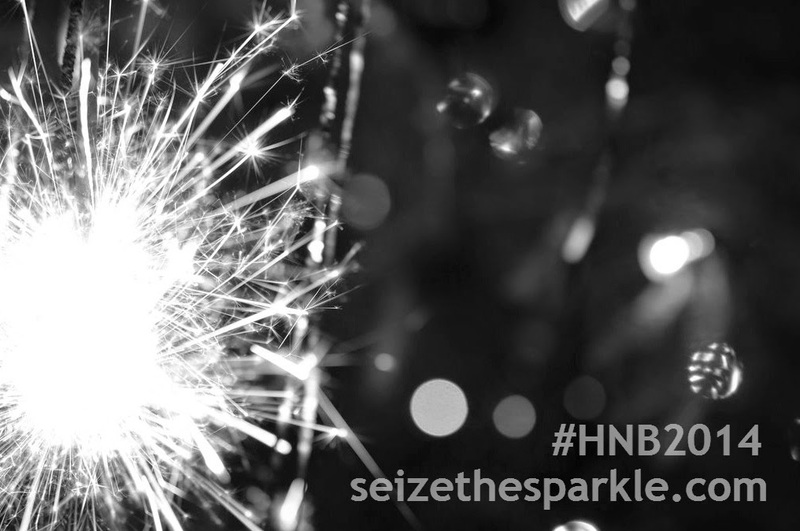 It's no secret that I'm alllllll about the sparkle and glitter. The more, the better! So, the Holidays are always a fun time for me, because all kinds of new glitter polish = all kinds of new ways to sparkle!!! 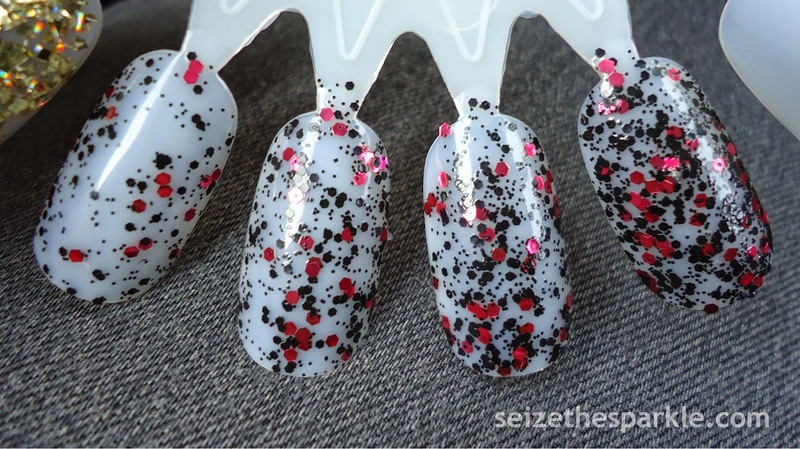 Unwrap Me contains a glittery mix of metallic red hex glitter and smaller matte black hex glitter. Yep. Matte. Black. Hex. Glitter. It's thee best way to do black glitter in nail polish, hands down. I also love how the difference in glitter finishes gives this polish depth and detail. This layering turned out really well. I especially like how Unwrap Me pops over Muse. Now, if only I had a black and red plaid flannel tunic to wear with this ah-mazing layering. Maybe it's the No Buy talking, but it's all I can think about when I look at my nails! Unwrap Me is part of SinfulColors Holiday 2014 Collection. 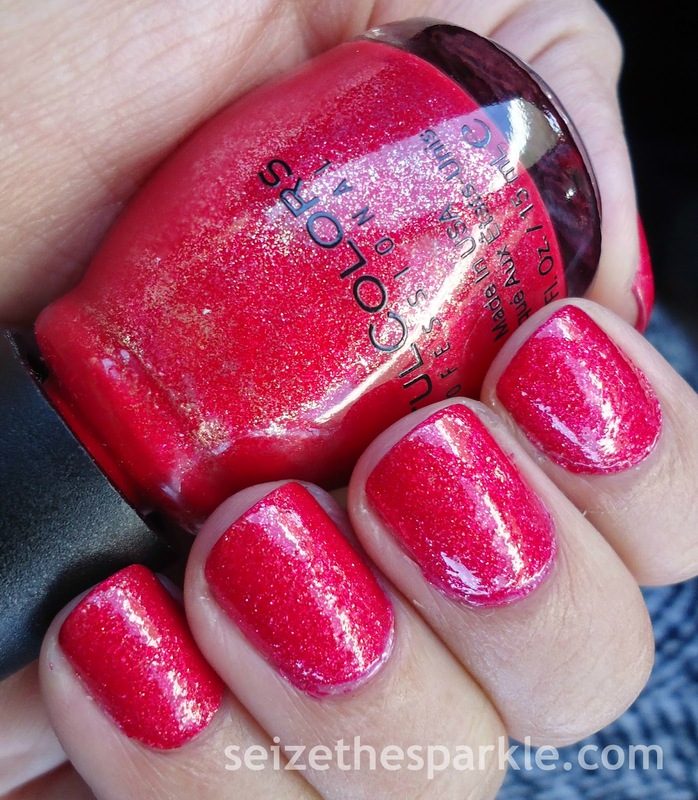 You can find it in the SinfulColors Holiday display, available exclusively at Walgreens for $1.99 a bottle! 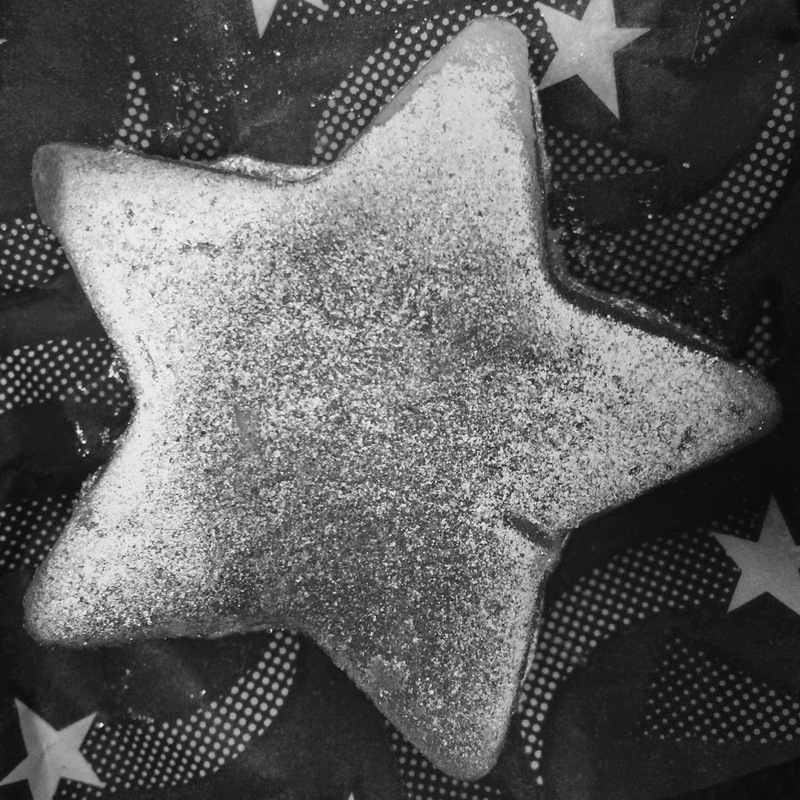 Other SinfulColors shades Decked with Glitter Flakes include Decadent, Galax-Sea, Holiday Rebel, and Twilight Twinkles. Follow SinfulColors on Facebook and Twitter. This turned into a bit of a failicure. Either way, try, Try, TRY again, I will! 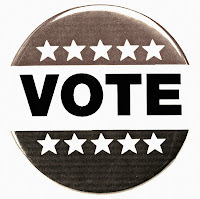 At the moment, I'm trying my very best to get over a nasty virus that has claimed my voice. I didn't set out to drain the honey bottle, but I just might end up doing that with all the tea I've been drinking! Here's to kicking these germs this weekend. Hope you have a great one! Blue is definitely showing up all over the place this season! And we're not talking your typical Fall navy or icy Winter blue. We've got cerulean, cobalt, azure blue, and in the case of Ice Blue from SinfulColors... "soft indigo exploding with silver sparkle." Ice Blue isn't a duochrome, but it definitely evokes that feeling on the nail, thanks to the unique blend of sparkles and shimmer. The base is a really sheer purple leaning blue. Add in shimmery turquoise, indigo, purple, and silver sparkles, and Ice Blue packs quite the glittery punch! Application was super easy. Honestly, I've come to prefer the SinfulColors brush. I always seem to get better lines with minimal cleanup afterward. The formula on Ice Blue was the same quality I've come to know and expect from SinfulColors. So... why 4 coats? Well, Ice Blue is sheer, but not unbuildable. I could've easily stopped at 3 coats, I was just curious to see just how the formula built up on my nails. The first coat was visible VNL sheer, but had incredible glitter payoff. I'm thinking Ice Blue might make a good layering polish. (I'll definitely be checking that out!) The second coat added more sparkle and really upped the coverage. 3 coats gave me full coverage, but like I said, I added the 4th coat, because 4 is always better than 3... right? Sparklelogic! I'm really loving this polish, and it's probably going to be a part of the Ruffian mani for Fishbowl Friday! While I'm not sure what other color I'll be using to create that mani, I am contemplating layering a coat of Ice Blue on top of the whole thing, just to test out the layering possibilities. Aaaaand I'm also kind of wondering what this shade would look like mattified. Ice Blue is part of SinfulColors Holiday 2014 Collection. You can find it in the Blue and Gold Holiday Wishes Display, available exclusively at Walgreens for $1.99 a bottle! The full collection also contains All About You, Cinderella, Endless Blue, Gold Medal, Hottie, and Midnight Blue. Follow SinfulColors on Facebook and Twitter. 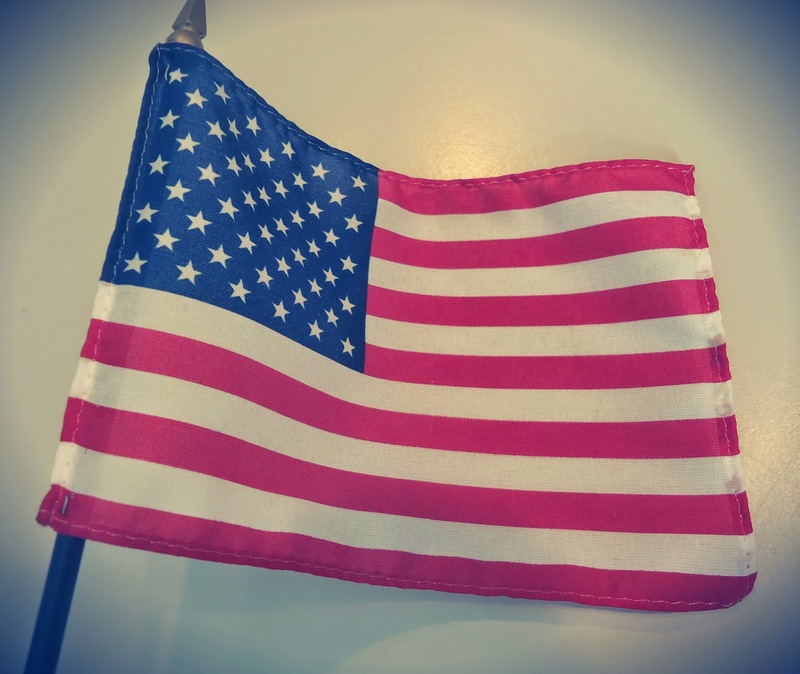 For this week, I'm lumping in my Holiday No Buy update here... sometimes, you just have to kill two birds with one stone, and this is definitely one of those weeks! 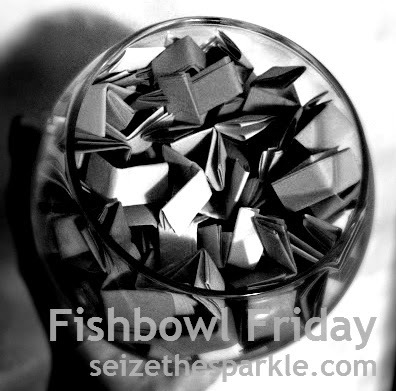 I pulled the prompt for Fishbowl Friday numbero five and got RUFFIAN. Not gonna lie, kind of excited to try one, because I've never done one! So... stay tuned for that on Friday, when I, along with the rest of the world, let out a collective sigh and rejoice because the weekend will finally be here. It's been crazy around Chez Sparkle lately. Note how I haven't mentioned anything about NaNoWriMo lately? Well... that's because I made it to a whopping 4,000ish words, and LIFE. 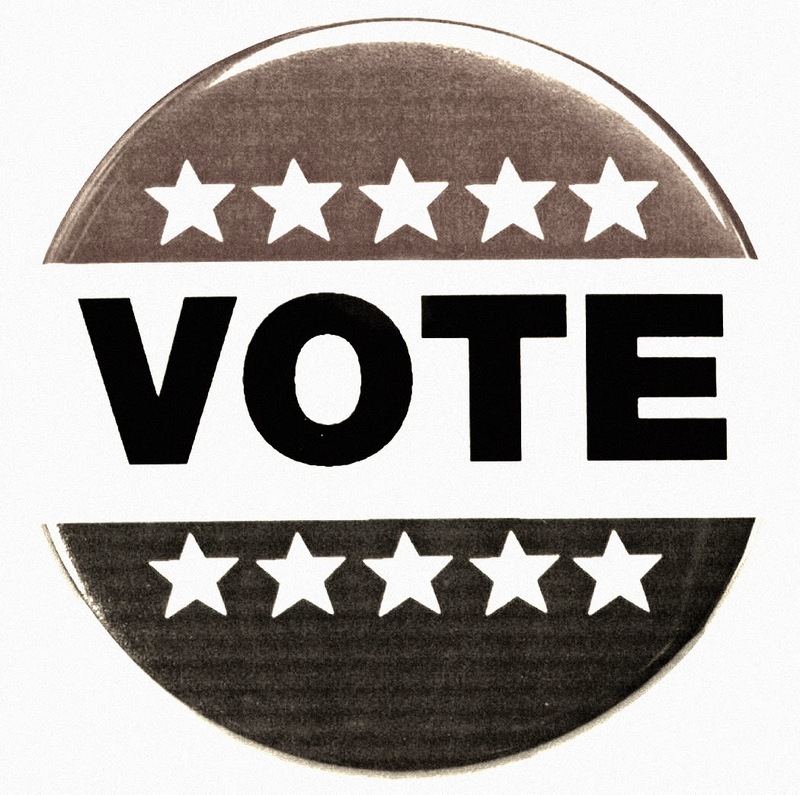 What is it about November? Could we get a petition going to the Office of Letters and Light that November does nawt work for me. It's really just the most horrible month to accomplish anything. 96% convinced that I need to take this plot to Camp NaNoWriMo in April or July. Bah. Last Saturday, that wonderful virus that's been going around Toddlerland hit Peanut. 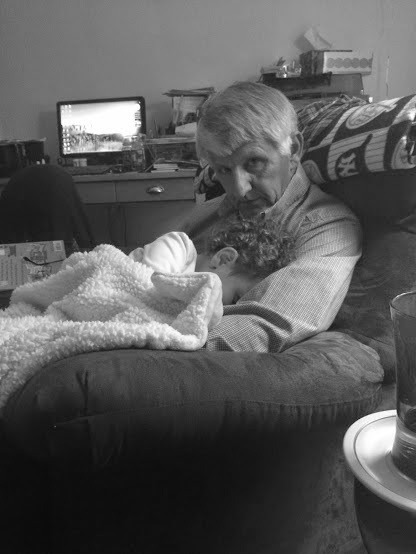 Sooooo we spent almost the entire day snuggled on the couch dozing on and off. We've been using the Nebulizer before bed and running the humidifier 24/7. It hasn't stopped her from rubbing her nose all over me rather than use a tissue, but it is helping her cough a little. Then there's her sleep schedule... Monday night, we were up watching Daniel Tiger in the big bed until almost 2. Last night, she brought out her best stalling tactics, squirming, crying, flailing, and my personal favorite, going completely boneless. Eventually I got her settled in with a book, turned out the light, and scampered out of the room as fast as I could. Pretty sure I was in bed 20 minutes later, if not sooner. This morning, she got a bath, I got a shower, I got all ready, and then Peanut didn't really want to do anything the first time I asked. Or second. Or third. It was a morning full of bribes, trades, all of the tricks in my mom book to get the both of us out the door... 45 minutes behind schedule. Annnnnd... did I mention that on top of all that, I'm sick too? Sinuses are draining, throat is scratchy, and I haven't been able to taste anything since Saturday. Boo. But we've got to be heading up from here, right? As of right now, I'm really looking forward to soaking in a nice hot bath, doing something with my nails, drinking a cup of chamomile tea, and drifting off to sleep. You know, assuming that I don't just spend the night snuggling with Peanut and go to bed at the same time she does. Because that sounds awfully nice, too. The longer I wear this polish, the less I want to take it off. It's sparkly, cranberry deliciousness in a bottle. I can't believe it's taken me this long to wear it. It's thee perfect Fall/Winter/Holiday shade. 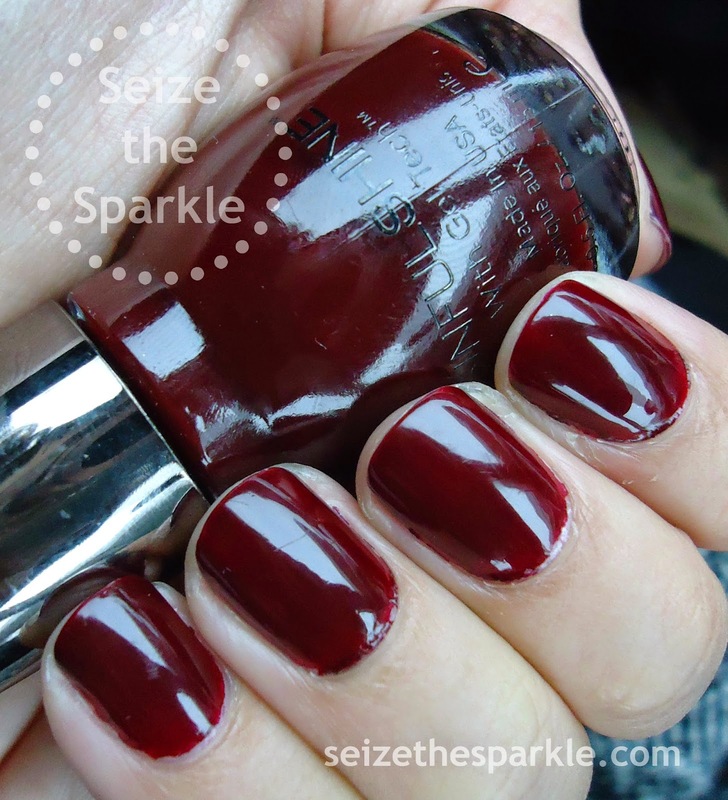 Originally, Ruby Mine was part of the SinfulColors Crystal Crushes Collection from Fall 2013. I managed to pick up Treasure Chest and Emerald Envy when last year's No Buy was over, but for the most part, I missed out on the sparkly awesomeness of the Crystal Crushes. Booooooo. 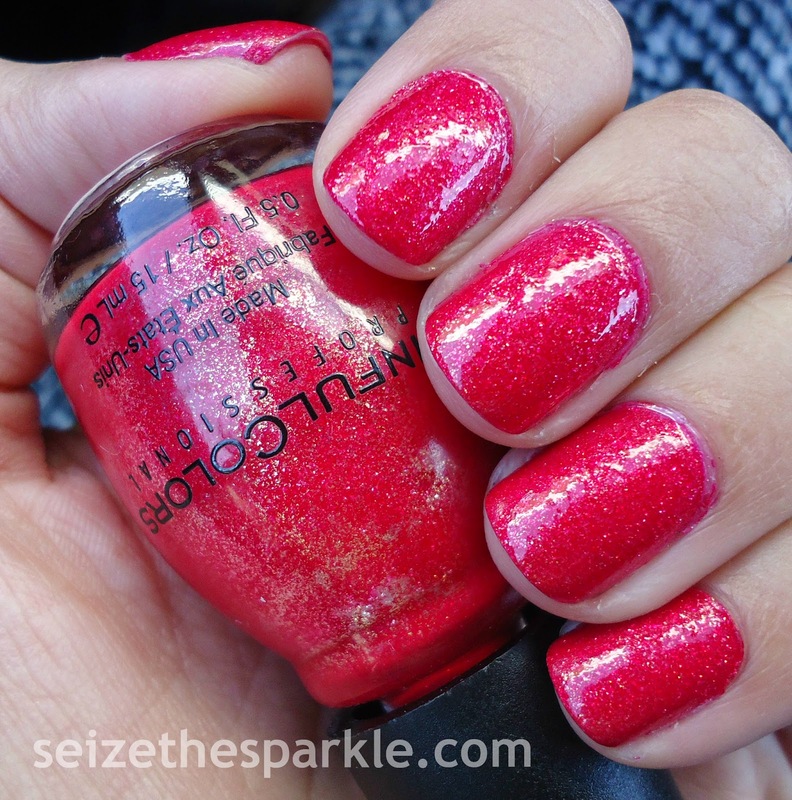 Ruby Mine is a textured slightly pink-leaning red polish with fine pink and gold sparkles. To be honest, I completely forgot about the texture until I started painting! 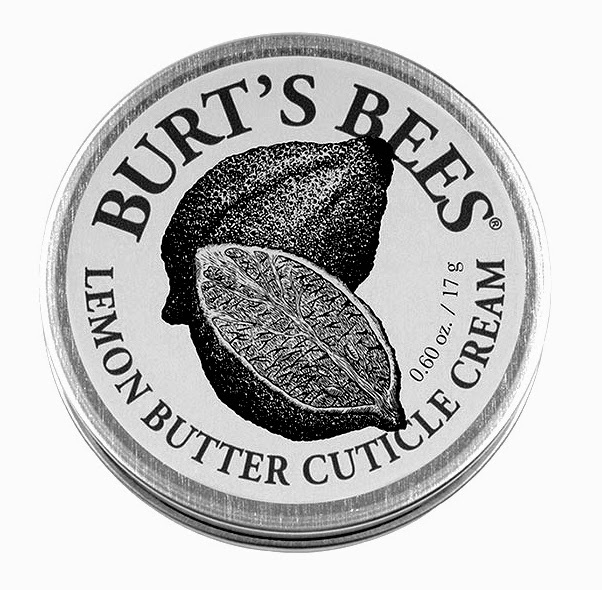 The formula is great, probably my favorite of all the textured polishes I've tried so far. Amazing coverage and lots of forgiveness! You could easily get away with just two coats, as long as you don't forget to wrap your tips like me! This shade is definitely going to stick around for the Holidays. It's making me think cranberries, candy-canes, wrapping paper, santa hats, all that good stuff! I'm not sure if I could stamp over Ruby Mine, but I think using it to stamp or do a tape mani would really add depth and interest because of the texture. What do you think of Ruby Mine? The weather is getting chillier, and that means my nails are getting darker! 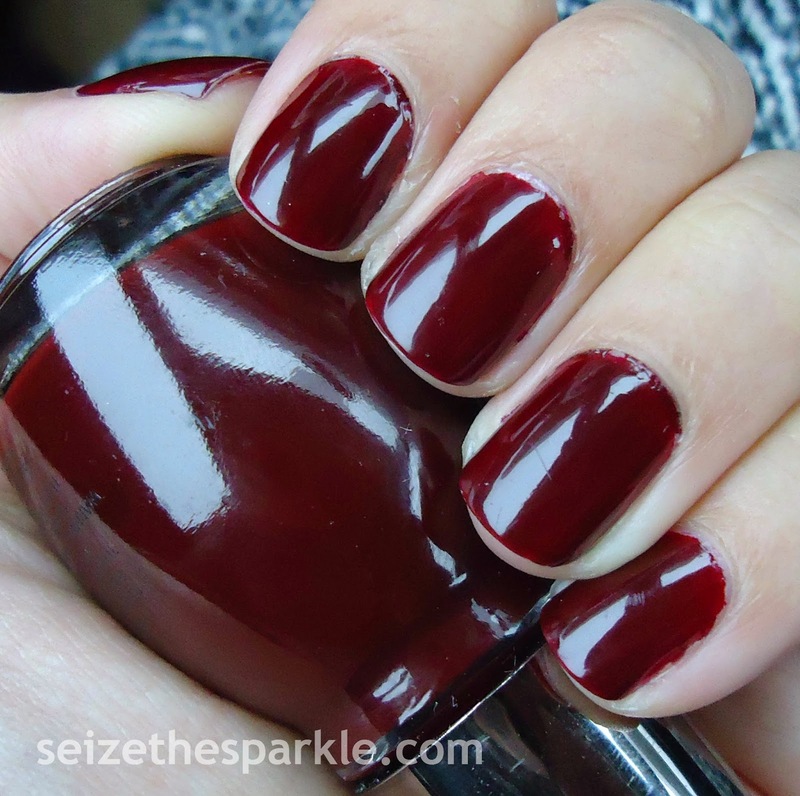 Because, who doesn't think cold, Winter weather and rich, vampy polish shades were just meant to go together? Especially with a nice mug of steaming, hot coffee... YUM! I know that it's still officially more than a month away, but it feels like Winter came early this year. Our forecasted high tomorrow is 27... for the high! Guaranteed Sarah-cicle weather... BUT thanks to Mirror, Mirror... I'm feeling the chill just a little bit less. A warm scarf and riding boots don't hurt either! Mirror, Mirror is one of those shades of red that just feels right this time of year. I normally pass on shades like this, and then regret that decision when I'm in a crisp/salted caramel/cranberry-all-the-things kind of mood. Sooooooo, yay! This year, I'm a little bit ahead of the game. Woohoo!!! 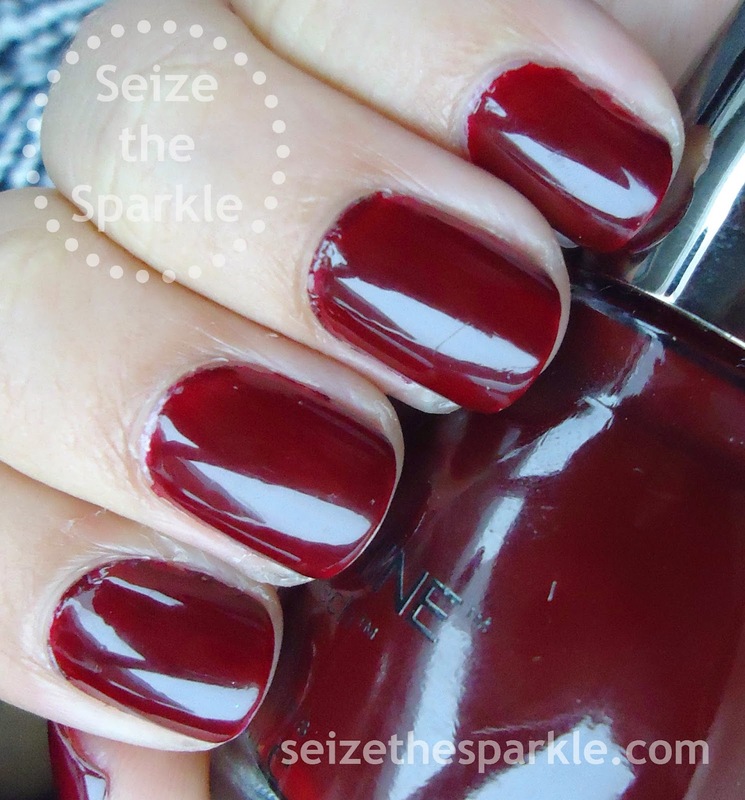 SinfulShine polishes are great to work with, and this one was no exception. 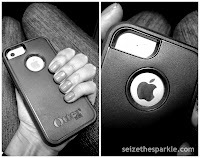 Three easy coats for the coverage you see in the photos! Mirror, Mirror does have a slightly jelly finish to it, which adds a nice amount of shine in addition to their already uber-shiny formula. 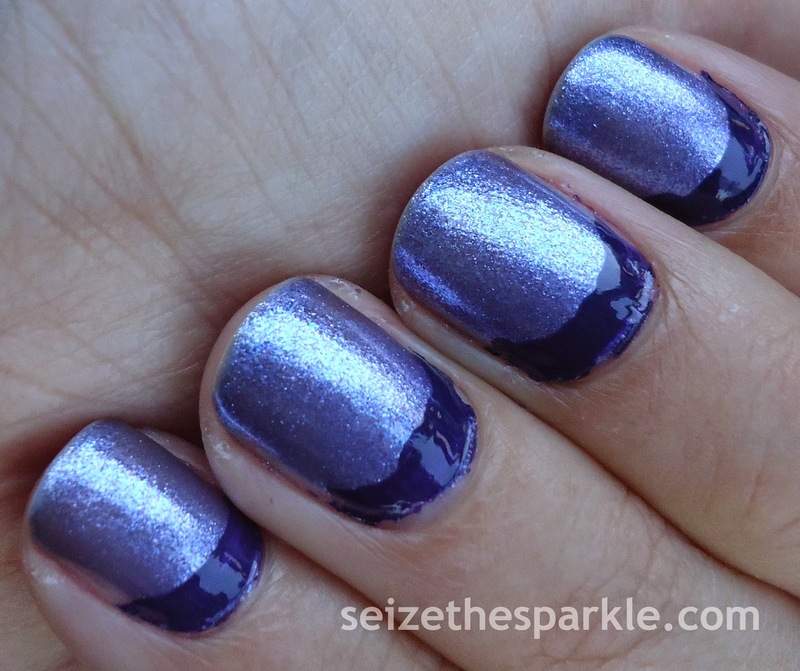 This is a really pretty shade, and I'm honestly torn between keeping it on and stamping it, or switching up my base coat and using Mirror, Mirror to stamp. Or maybe add some glitter? What to do... what to do?!? The base of this manicure started out simply enough. Sinful Colors Smokin' for the base on my left pinky, ring, pointer, thumb, and right thumb, middle, and ring fingers. 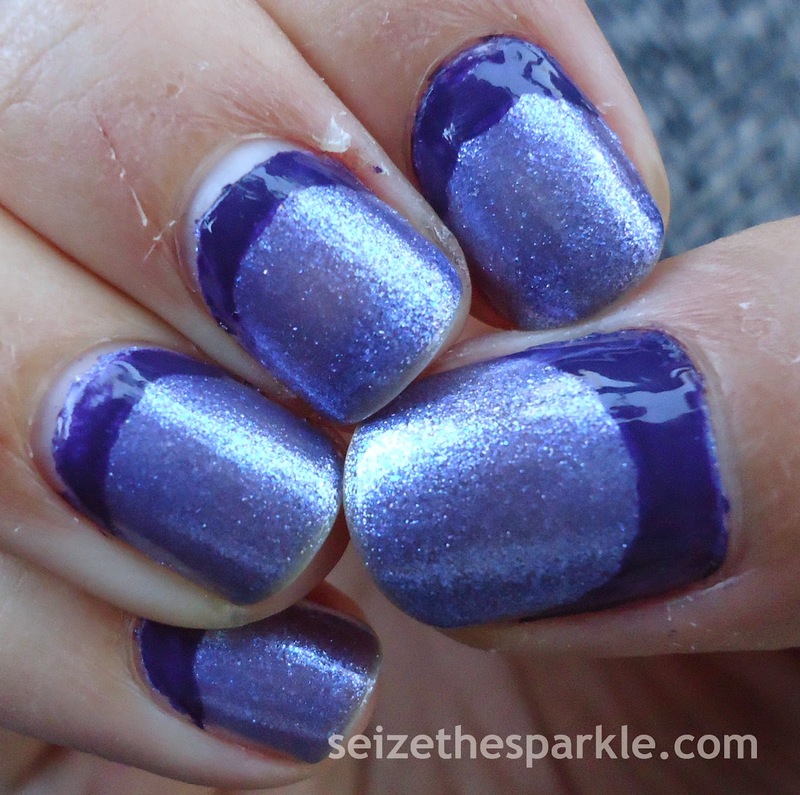 Then, my left ring, right pointer and pinky got a base of Blue Crushin', also from Sinful Colors. I pulled out a couple of glitters and metallics and just started sponging and painting. I didn't really have a particular pattern in mind. For me, nothing says fun like glitter and sparkles, so I just sort of dabbed here and there until I was happy with the way each nail looked. Then I added 2 clear coats for extra shine, and finished it all off with a coat of Good To Go to set everything in place. As much as I like this prompt and the manicure that came from it, I'm hoping for something a little more direct next week! Also, I'm going to try and keep my duochromes out of the mix next time. I really tried this week, but my mani needed that extra bit of sparkle and flash. Doesn't it always?!? My daughter loves Elmo. Most 2 year olds do. 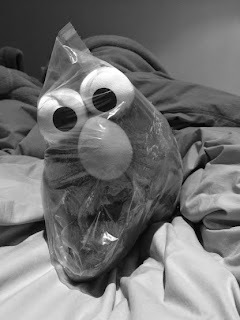 So, when it came time for Christmas ideas this year, Elmo definitely made the cut. 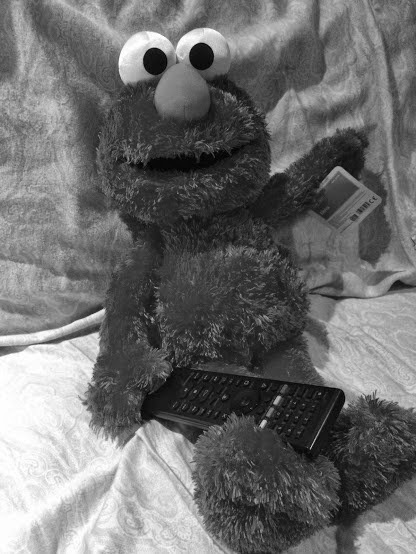 But which Elmo to pick? Peanut already has 2 small stuffed Elmo dolls, plus Lullaby and Goodnight Elmo. I was thinking about picking up Let's Imagine Elmo, but Mr. Sparkle beat me to it, ordering one that was "almost as big as she is." So, when the Amazon box came and it was a little smaller than what I was expecting, I figured that Elmo hadn't made this trip. I was wrong. I was sooooooo very wrong. Elmo made it all right. I haven't laughed so hard in a very, very, very long time. I'm almost ashamed to admit that. Almost. Also, I've gotta say, I'm really glad that Peanut didn't get to see him in his "shipped" state. She would've criiiiiiied... oh, the tears that would've flowed while demanding "out, owwwwwttttt!" Don't worry, though! 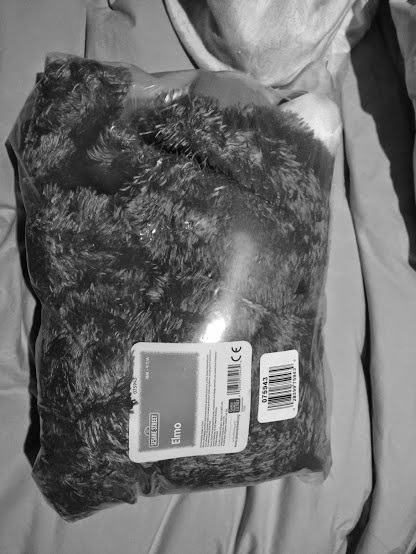 He puffed back up nicely and only required minimal squishing and smooshing of the head to return to normal. 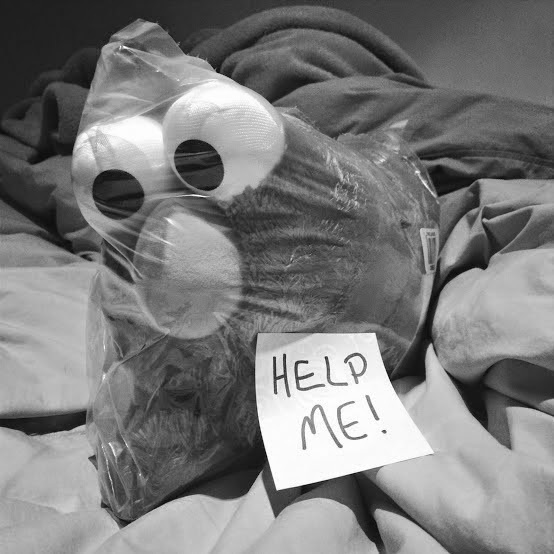 *No Elmos were seriously hurt during the making of this post. I could've let him out sooner... But where would the fun have been in that?!? 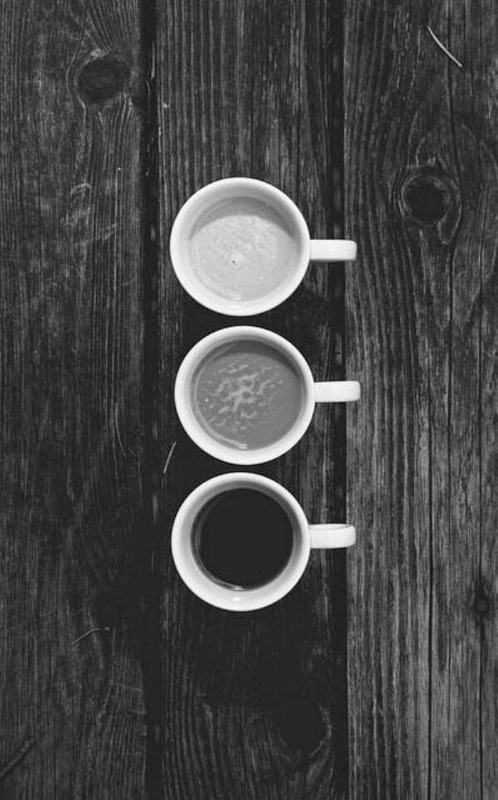 6 - Coffee. All The Coffee. I apologize... I've really been suffering from a lack of creativity lately, and a feeling that I have soooooo much to do, yet I don't seem to be accomplishing anything. Do you ever feel like that? Please tell me I'm not the only one! I'm working on it, I promise!